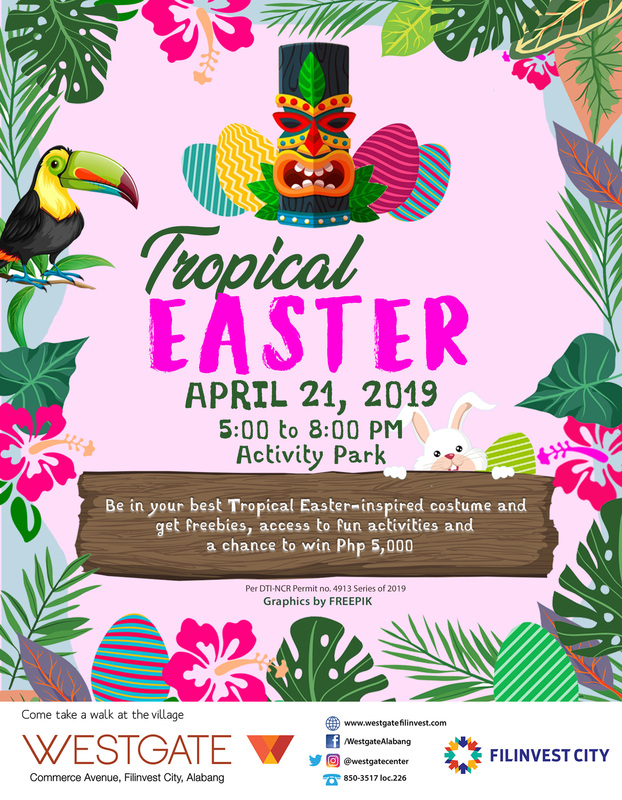 Be in your best Tropical Easter-inspired costume and get freebies, access to fun activities and a chance to win Php 5,000! 1. For a minimum purchase of Php 1,000 single receipt or up to a maximum of 2 accumulated receipts from any Westgate Center establishment from April 1 to 20, 2019 (10 AM to 9 PM) and April 21, 2019 (9 AM to 5 PM) entitles a customer to one (1) Tropical Easter event pass. 2. Present the receipt/s at the registration booth located at the Activity Park, Westgate Center on April 21, 2019 (5:00 PM) to claim the pass. 3. Westgate’s Tropical Easter is from 5:00 PM to 8:00 PM only. Registration is from 4:30 to 5:00 PM. 4. The event is open for kids 4 to 11 years old. Parents and/or guardians may accompany the participating children. 6. There will three (3) costume contest winners to be announced around 8:00 PM, each will be given Php 5,000 in cash. Prizes can be claimed immediately after the event at the Activity Park, Westgate Center. 7. Employees of Westgate Center, Filinvest Lifemalls, Maverick House of Creative Media Inc. and participating merchants including their relatives up to second degree of consanguinity or affinity are disqualified from joining the promotion.